The FMPA has released the first wave of the 2019 Conference & Awards partnership opportunities. The event, now in its SIXTH year, will once again take place at the Radisson Blu East Midlands Hotel on 17th/18th May 2019. 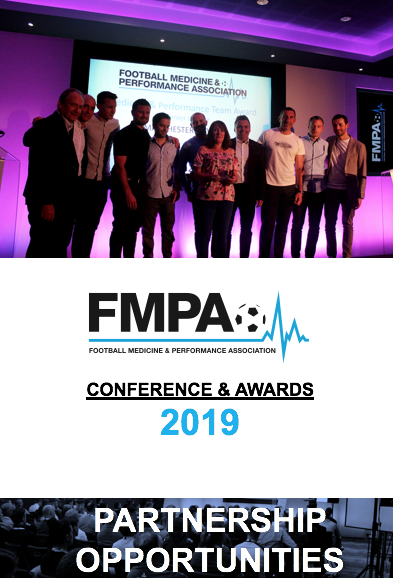 The FMPA Conference and Awards brings together an impressive audience of medicine and performance practitioners and has become a must-attend event in the football calendar, offering sponsors an ideal environment and captive audience to make new contacts, connect with existing clients and engage with those that matter in the professional game. Our 2018 exhibition stands, which quickly sold out, welcomed almost 300 delegates to the two day event and 2019 looks set to beat this number. Click on the link below to view the first wave of our partnership packages to be released.